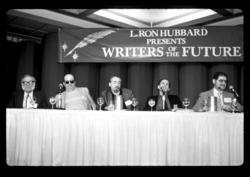 The 1987 Writers of the Future panel with Isaac Asimov, Gene Wolfe, Robert Silverberg, Roger Zelazny and Larry Niven. Science fiction does not come after the fact of a scientific discovery or development. It is the herald of possibility. It is a plea that someone should work on the future. It was 25 years ago, April 1987, at the Writers of the Future Awards event held in New York City that a time capsule was sealed with predictions from several of science fiction’s top writers and America’s top science minds, all answering the question, “What will life be like in the year 2012?”. In the introduction to his epic Science Fiction novel Battlefield Earth, L. Ron Hubbard stated, “Science fiction does not come after the fact of a scientific discovery or development. It is the herald of possibility. It is a plea that someone should work on the future.” So it was only fitting that it would be at a Writers of the Future Awards event that science fiction writers and scientists would come together and offer their vision of what the future would bring. Those who placed their 25 year prediction included such famous authors including Isaac Asimov, Algis Budrys, Orson Scott Card, Larry Niven, Frederik Pohl, Jerry Pournelle, Tim Powers, Robert Silverberg, Jack Williamson, Gene Wolfe and Roger Zelazny, along with newcomer Dave Wolverton, that year’s grand prize winning writer. Top scientists with their look into the future included Nobel Prize winner in Physics, Sheldon Glaskow, and Columbia University physicist, Gerald Feinberg. While we must all wait to see just how accurate these forecasts will have proven themselves to be, it will be at the awards ceremony taking place at 6:30 PM on April 15, 2012 at the historic Wilshire Ebell Theatre, Los Angeles, CA, that the time capsule will be opened and the entire contents displayed for all to see after the ceremony. RSVP to contests(at)authorservicesinc(dot)com or call 323-466-3310. To see the awards ceremony online, go to http://www.youtube.com/writersofthefuture.